Gianna Rose - Figural Soaps | P.C. Fallon Co. These beautiful sculpted soaps make exquisite gifts and lovely accents for your powder room. Many are packaged in lovely boxes with ribbon ties, and also may include porcelain soap dishes. Triple-milled soaps are vegetable based and contain natural extracts and wonderful fragrances. Find favorite animals, such as rabbits, dogs, owls, cats, and frogs, as well as flowers, shells, and Robin's eggs to accent the bath. 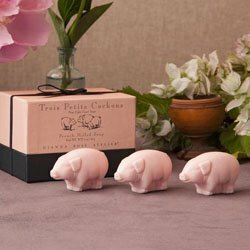 From the romantic heart soaps and rose petal guest soaps to a turtle on a lily pad soap dish or a pair of garden boots, this collection offers something for everyone to enjoy.